Multidrug and toxic compound extrusion (MATE) transporters, which exist widely in plants, function as crucial regulators in plant resistance to aluminum (Al) toxicity by inducing citrate efflux. However, the functions of most MATE family members in soybean (Glycine soja) remain to be elucidated. Expression pattern analysis showed that GsMATE was constitutively expressed in different soybean organs, with the highest level in root compared with those in stem, leaf and cotyledon. In addition, Al stress induced expression of GsMATE in soybean. Temporal analysis indicated that GsMATE expression was greatly enhanced by increasing concentrations of aluminum [Al3+] after short exposure, reaching the high levels detected in the BW69 (Al-resistant) and the JW81 (Al-sensitive) lines of Glycine soja of wild soybean at 6 h and 8 h, respectively. Furthermore, transient GsMATE expression in Arabidopsis protoplasts showed that GsMATE protein localized to the plasma membrane. Overexpression of GsMATE on an Arabidopsis columbia-0 (Col-0) background resulted in increased Al tolerance in transgenic plants. Analysis of hematoxylin staining showed that the roots of GsMATE transgenic lines were stained less intensely than those of the wild-type exposured to the same AlCl3 concentrations. Therefore, GsMATE enhanced the resistance of transgenic plants to Al toxicity by reducing Al accumulation in Arabidopsis roots. In summary, our results indicate that GsMATE is responsive to aluminum stress and may participate in the regulation of sensitivity to Al toxicity in Arabidopsis. In addition, the GsMATE protein is an Al-induced citrate transporter of the MATE family and exerts an essential role in Al tolerance in Glycine soja. Acid soils (pH < 5.5), representing up to 50% of arable land, are widely distributed in developing countries in Africa, Asia, and South America [1–3]. Solubilized aluminum (Al), the most toxic trivalent cation (Al3+) which forms an Al complex in aluminosilicate clays (pH < 5.5), is a major limiting factor for plant growth and crop yield in acidic soils . Al3+ toxicity primarily damages the root apex, causing significant reductions in plant growth and development by affecting the plasma membrane structure, inducing root cell death and inhibiting nutrient uptake [5, 6]. To date, two main types of Al-resistance mechanisms have been investigated in most plant species such as maize, wheat, and sorghum. 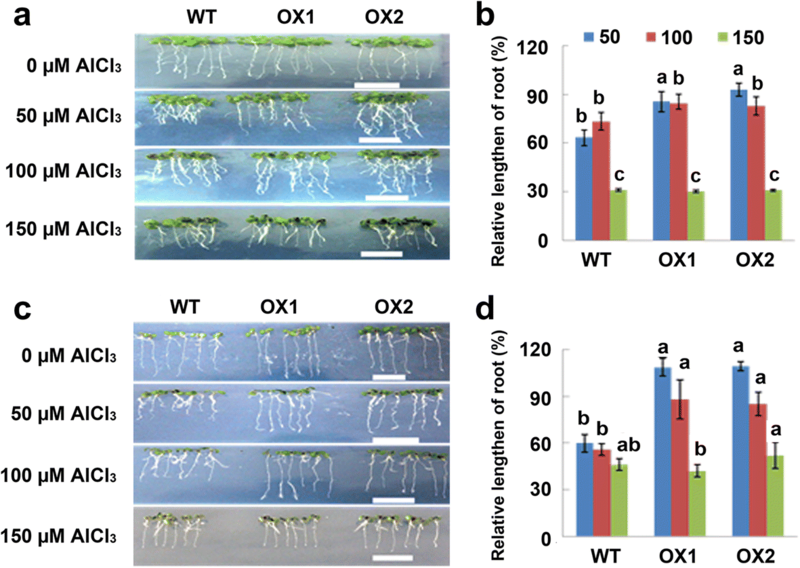 The exclusion mechanism prevents Al from entering the root apex, while tolerance mechanisms detoxify and sequester Al in plants [1, 3]. 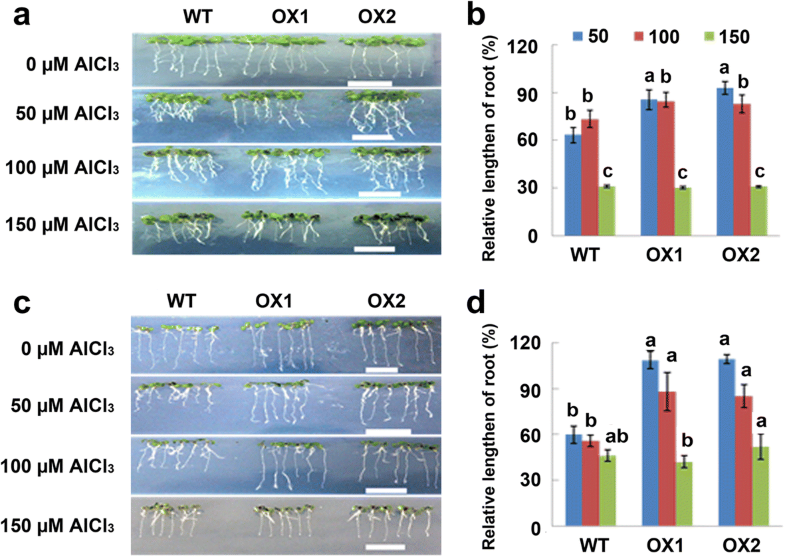 Under Al stress, plants enhance their resistance to Al toxicity by root exudation of organic acids including malate, citrate and oxalate [7–11]. Multidrug and toxic compound extrusion (MATE) transporters have recently become the most categorized multidrug efflux transporter family. These proteins couple with substrate translocation across the plasma membrane with an electrochemical gradient of cations (such as H+ or Na+ ions) . X-ray crystallography indicated a unique structural topology of the predicted 12 transmembrane (TM) helices in the MATE transporter that was distinct from that of other multidrug resistance transporters . MATE transporters exist widely in bacteria, fungi, mammals and plants . Many MATE genes, which encode proteins that induce citrate efflux in response to aluminum toxicity, have also been investigated and characterized in plants . Using map-based cloning, SbMATE and HvAACT1 were the first MATE transporters shown to be involved in detoxification of Al in sorghum and barley [15, 16]. Since then, a number of MATE genes have been reported to be involved in the Al-induced secretion of citrate in herbaceous plants. These genes include AtMATE in Arabidopsis [6, 17], TaMATE in wheat , ZmMATE1 in maize , ScFRDL1 in rye , HvAACT1 in wheat and barley , SbMATE in barley , BoMATE in Arabidopsis , OsFRDL2 in rice , FeMATE1 and FeMATE2 in buckwheat , BdMATE in Setaria viridis , and MtMATE66 in Medicago truncatula . All these homologous genes encode MATE proteins that are required for external Al-resistance, and are primarily localized to the root epidermis cells [16, 17, 20, 23]. Some plant MATE transporters play diverse roles in iron homeostasis [26–32]; heavy metal , and toxin resistance ; vacuolar transport of nicotine [35–37]; chloride channels ; abscisic acid (ABA) efflux ; transport of secondary metabolites such as alkaloids, flavonoids, and anthocyanins [36, 39–42]; hypocotyl cell elongation ; export of hydroxycinnamic acid amides ; organ initiation ; regulation of lateral organ size and initiation rate ; plant growth and development ; the establishment of plant disease resistance ; and resistance to viruses , etc. Previous studies have shown that the MATE proteins are a large family of multidrug efflux transporters in plants . Many putative MATE transporters have been predicted and identified by genome-wide analysis and/or other methods in plants. These putative MATE transporters include 45 in Oryza sativa , 49 in maize , 56 in Arabidopsis thaliana [33, 50], 67 in tomato , 70 in Medicago truncatula [26, 52], 71 in Populus , 70 MATE genes in Gossypium raimondii and 68 MATE genes in Gossypium arboretum , and 117 in Glycine max . Compared with other plant species, soybean has the largest MATE family with 117 putative MATE transporters predicted by genome-wide association analysis and RNA-seq Atlas of Glycine max . However, few studies have been conducted on MATE transporters in soybean. To date, only two MATE transporters, GmFRD3a and GmFRD3b, have been reported to play a role in iron homeostasis in soybean [31, 55]. In the current study, GsMATE (accession number: BM732932.1) was cloned from the wild soybean root of the BW69 line (Al-resistant) of Glycine Soja, and the gene expression pattern was detected in response to Al treatment. The function of GsMATE was identified and characterized on subcellular localization and citrate transport activity along with phenotypic analysis of transgenic overexpression lines of Arabidopsis. We hypothesized that GsMATE would enhance Al tolerance in Arabidopsis via Al-induced secretion of citrate from the root. 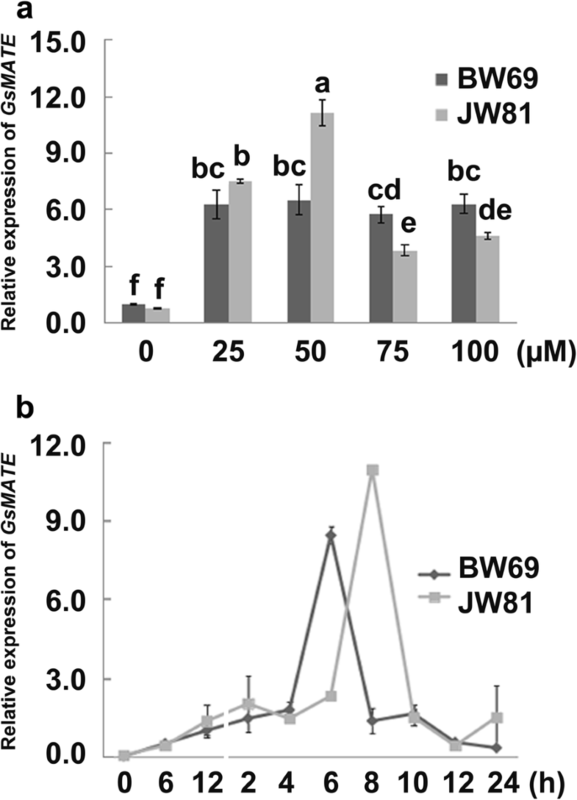 The BW69 (Al-resistant) and the JW81 (Al-sensitive) lines of Glycine soja were used to clone GsMATE for investigation of GsMATE expression patterns in response to Al stress. The wild soybean seed coat was lacerated gently with a single-sided blade on the back of the hilum. Then, all seeds of wild soybean were grown under growth chamber (22–25 °C, 12-h/12-h light/dark cycle) as described previously by Zeng . After germination, the seedlings were pre-cultured for 48 h in surface-sterilized vermiculite and transplanted into the nutrient solution (pH 5.8) after the spread cotyledons. After two days cultured at 22/25 °C with a 12-h/12-h light/dark cycle, the soybean seedlings were treated in aluminum solutions . Ecotype Col-0 of Arabidopsis was used for GsMATE gene transformation. All the surface-sterilized Arabidopsis seeds (wild-type and transgenic lines) were cultivated on 1/2 Murashige and Skoog (MS) agar medium in darkness for 2 days at 4 °C. The Arabidopsis seedlings were then transferred to new 1/2 MS medium containing aluminum concentration gradients for continuous culture for several days at 22 °C under long-day conditions until all the samples were taken . To analyze the tissue expression pattern of GsMATE, the BW69 and JW81 lines were germinated in sterilized vermiculite. The seedlings with open cotyledons were cultured in the nutrient solutions for four days. Samples of root, stem, leaf and cotyledon were taken from the seedlings (n = 10 plants per group), frozen in liquid nitrogen, and then stored at − 80 °C . To analyze the influence of the Al concentration gradient on gene expression, the BW69 and JW81 lines were planted and germinated using the method described previously . In brief, after pre-incubation for two days, the soybean seedlings were transferred and cultured in the solutions of 0, 25, 50, 75, and 100 μM AlCl3 (pH 4.3, 0.5 mM CaCl2), respectively; three replicates of 20 seedlings were prepared for each group. After treatment with aluminum solutions for 6 h, root tip samples (6 cm long) were obtained from the seedlings (n = 10 plants used per group). Samples were frozen in liquid nitrogen and then stored at − 80 °C . To analyze the pattern of GsMATE expression in different root segments in response to Al toxicity, the soybean seedlings were prepared using the method described previously. Samples were obtained from seedling roots (sections 0–2, 2–4, and > 4 cm) after 6 h of treatment in Al solutions (n = 10 plants per group), frozen in liquid nitrogen and stored at − 80 °C for further analysis . To analyze the temporal expression pattern of GsMATE in response to Al toxicity, two-day-old seedlings were cultured in a solution of 0.5 mM CaCl2 (pH 4.3) for 12 h. Root tip samples (6 cm long) were obtained from the seedlings after the time course treatments set as 0, 6 and 12 h, respectively. The other seedlings were then transferred to a solution of 50 μM AlCl3 (pH 4.3, 0.5 mM CaCl2) and cultured for 24 h (n = 20 seedlings per group). Root tip samples (6 cm long) were obtained from the seedlings treated after 2, 4, 6, 8, 12, and 24 h, respectively. All the samples were frozen in liquid nitrogen, and stored at − 80 °C for further analysis . According to our previous analysis of the expression profiles of genes involved in acidic aluminum tolerance in BW69 and JW81 lines, one Al-induced GsMATE gene was identified by screening the database of the National Center for Biotechnology Information (NCBI) with the sequence information (unpublished data); the gene was assigned the accession number of BM732932.1. Specific primers (Additional file 1: Table S1) were designed to amplify the full-length sequence of GsMATE by RT-PCR using Super-Fidelity DNA polymerase (Phanta Max, Vazyme Biotech Co., Ltd.; Nanjing, China). Total RNA was extracted from the seedlings of BW69 under the treatment of 25 μM AlCl3 (pH 4.3, 0.5 mM CaCl2) using TRIzol reagent (Invitrogen). The cDNA was generated using 2 μg of total RNA by reverse transcription with SuperScript II reverse transcriptase (Invitrogen). Using cDNA of BW69 as a template, the reaction of RT-PCR was performed in a total volume of 20 μl according to a previously described method  followed by the amplification program: DNA denaturation at 94 °C for 30 s, annealing at 72 °C for 30 s, elongation at 72 °C for 1 min and 30 s (35 cycles). The GsMATE PCR product was isolated by 1% agarose gel electrophoresis (GenStar Kit, Genstar Development Company, Canada) and then inserted into the multiple cloning site of the pLB vector (Tiangen Rapid DNA Ligation Kit, Beijing, China). Clones of E. coli that were positively transformed into competent cells of DH5α strains with the GsMATE-pLB vector using the method of heat-shock were identified by PCR, enzyme digestion and sequencing (Sangon Biotech (Shanghai) Co., Ltd., China) to obtain the full cDNA sequence of GsMATE. The methods of PCR identification and enzyme digestion for the positive clones were previously described in detail [57, 58]. Multiple alignments of sequences were carried out, and a homology tree was generated using DNAMAN software. The nucleotide and amino acid sequences were used to search for GsMATE and/or its homologous proteins using the BLAST network servers of the NCBI (https://blast.ncbi.nlm.nih.gov/Blast.cgi) and phytozome (https://phytozome.jgi.doe.gov/pz/portal.html) . Prediction of the transmembrane topology of GsMATE protein was performed using the TMHMM Server website v. 2.0: http://www.cbs.dtu.dk/services/TMHMM/. The 1,503 bp GsMATE coding sequence (CDS) (Additional file 2) amplified from the GsMATE-pLB vector was inserted into the BamHI and KpnI sites of a pCAMBIA1301 vector with a β-glucuronidase (GUS) reporter to generate the pCAMBIA1301-GsMATE fusion construct under the control of the cauliflower mosaic virus 35S (CaMV 35S) promoter using specific primers (Additional file 1: Table S1). Agrobacterium tumefaciens GV3101 was then transformed with the pCAMBIA1301-GsMATE vector by electroporation, and full-flowering Arabidopsis plants were transformed using the floral dip method described previously . All the GsMATE transgenic plants were obtained by hygromycin screening using 1/2 MS media. Localization of the GsMATE protein was performed using a previously described method . Specific primers were used to amplify the full GsMATE CDS (Additional file 1: Table S1). The PCR product of the GsMATE CDS was subcloned into the BamHI and KpnI sites of the pYL322-d1 vector to generate a GsMATE-GFP fusion construct under the control of CaMV 35S promoter. The pYL322-d1-GsMATE-GFP construct was confirmed by sequencing and used for transient transformation of Arabidopsis protoplasts by heat-shock. Transformed Arabidopsis protoplasts were then observed under a confocal laser scanning microscope (Leica) to characterize GsMATE protein expression [57, 60]. Total RNA was extracted from the seedlings of soybean or Arabidopsis using TRIzol reagent (Invitrogen) and treated with RNase-free DNase (Promega). Total RNA of 2 μg was used to generate cDNA by reverse transcription with SuperScript II reverse transcriptase (Invitrogen). The cDNA from each sample was then diluted to 4 and 8 ng/ml. Triplicate quantitative assays were performed on 1 ml of each cDNA dilution with the SYBR Green Master mix and the SsoFast EvaGreen Supermix Kit (BIO-RAD) on an ABI 7900 sequence detection system according to the manufacturers’ instructions. The data were normalized using the reference gene β-tubulin. The quantitative variation between the examined replicates was evaluated by the 2–∆∆Ct method . Details of the GsMATE andβ-tubulin specific primers were listed in (Additional file 1: Table S1). For short-term AlCl3 treatment, T3 generation Arabidopsis seeds were sown in plastic petri dishes (10 cm diameter) filled with 1/2 MS phytagel medium (pH 5.8) and incubated at 4 °C in the dark for four days before transferred to a culture room (16-h light/8-h dark) at 22 °C for four days. Then, Arabidopsis seedlings were transferred to agarose medium containing AlCl3 (pH 4.5, 0.5 mM CaCl2) and cultured at 22 °C (16-h/8-h light/dark) for another two days. The seedlings were then exposed to AlCl3 (pH 4.5, 0.5 mM CaCl2) concentration gradients (0, 50, 100 and 200 μM), and main root measurements were carried out using a previously described method . For long-term AlCl3 treatment, the Arabidopsis seedlings were cultured for 7 days or more to observe the Al-resistance phenotypes and/or measure the main root length . Hematoxylin staining was used to further investigate the resistance of transgenic lines of Arabidopsis to Al toxicity . Arabidopsis seedlings were prepared according to the previously described method. The seedlings were then transferred into AlCl3 solutions (pH 4.5, 0.5 mM CaCl2) for 6 h. After 30 mins rinse in ultrapure water, the roots of the Arabidopsis seedlings were stained with hematoxylin for 30 min. After another 30 mins rinse in ultrapure water, the Arabidopsis phenotypes were recorded . All data were represented as the mean ± SD of three biological replicates. The t-test at p = 0.05 was performed to identify significant differences between observation values using SPSS20 software . Based on the gene expression profiles of Al-resistant Glycine soja (unpublished data), an aluminum-induced gene encoding a citrate transporter of MATE protein was cloned using the sequence of the Glycine soja BW69 line from the NCBI database under accession number BM732932.1. The MATE gene located on soybean chromosome 2 was then designated GsMATE (multidrug and toxin extrusion family protein of Glycine soja). The GsMATE gene was induced in more than twice expression level under the treatment of 25 μM AlCl3 (pH 4.3, 0.5 mM CaCl2) (data not shown). The full-length genomic GsMATE sequence included 13 exons and 12 introns, with a full-length cDNA of 1,955 bp (data not shown) and open reading frame (ORF) of 1,503 bp encoding 501 amino acids. The GsMATE sequence was deposited in the NCBI database under accession number BM732932.1 (Additional file 2: Table S2). Phytozome quick search and NCBI BLAST analysis of the conservative domains revealed that GsMATE protein belongs to the MATE family of multidrug and toxin extrusion proteins (Additional file 3: Figure S1a). Prediction using TMHMM (Server v. 2.0) showed that GsMATE protein is a membrane protein with 10 transmembrane helices (domains) at the amino acid positions 145–167, 193–215, 225–247, 254–276, 291–313, 326–348, 368–390, 402–424, 434–456, and 463–485. Ring structures were formed using the transmembrane domains (Additional file 3: Figure S1b). Multiple sequence alignments and homology analysis showed differences among the members of MATE family in plants. As shown in Figs. 1, 42 MATE proteins were clustered into three groups. Group I comprised 17 MATE proteins with diverse potential functions, including regulation of organ initiation (AtZRZ and ZmBIGE1); compound transport and accumulation of alkaloids (NtMATE1), proanthocyanidins (DkMATE1), nicotine (Nt-JAT1, NtMATE1 and NtMATE2), chloride (AtDTX33 and AtDTX35); iron homeostasis (AtBCD); and responses to abiotic stresses such as drought (AtDTX50). Group II comprised only one member, AtEDS5, which is required for salicylic acid (SA) synthesis in pathogen-challenged plants . There were 24 MATE proteins in group III performing major functions in Al-activated citrate transport or the regulation of iron homeostasis in plants (AtFRD3, GmFRD3a, GmFRD3b and OsFRDL1). At the amino acid level, GsMATE showed 56% similarity with other MATE transporters clustered in Group III, while the similarity among GsMATE, GmMATE13 and GmMATE58 exceeded 95% (Fig. 1). Therefore, the bioinformatics analysis indicated that GsMATE protein may function in Al tolerance. To investigate the tissue expression pattern of GsMATE, samples of young root, stem, leaf and cotyledon were taken from the BW69 and JW81 lines of Glycine soja. The analysis of quantitative real-time PCR (qRT-PCR) indicated that GsMATE is expressed constitutively in soybean with more than 3-fold expression levels in roots than those in stems and leaves (Fig. 2a). Further qRT-PCR analysis of GsMATE expression in different segments of the root measured from the tip showed that the highest and lowest expression under the check (0 μM AlCl3, pH 4.3, 0.5 mM CaCl2) in the 0–2 cm and 4–6 cm zones, respectively (Fig. 2b). However, the GsMATE gene was significantly up-regulated after Al treatment with almost twice expression levels in the root regions compared with those under the condition of the check (Fig. 2b). The GsMATE expression level at the root segment of the 4–6 cm zone of JW81 line was at least 3-fold expression level than that at the check treatment (Fig. 2b). GsMATE was significantly induced under exposure to the different Al concentration gradients, with 4-fold to 12-fold greater expression levels detected in the BW69 and JW81 wild soybean lines compared with those detected under control conditions (Fig. 3a). The GsMATE gene expressed highest level at the treatment of 50 μM AlCl3 with a significantly higher level up to 12-fold detected in the aluminum-sensitive JW81 line than those in the aluminum-resistant BW69 line. In contrast, at the higher concentrations of AlCl3 (75 and 100 μM), GsMATE expression in the aluminum-resistant BW69 line was significantly higher than that in the aluminum-sensitive JW81 line (Fig. 3a). The temporal expression pattern of GsMATE in response to acidic aluminum exposure was analyzed over a period of 24 h (Fig. 3b). Although the expression level of GsMATE was low at pH 5.8, it was much higher than those detected at pH 4.3 with similar expression patterns observed in both the BW69 and JW81 lines. The Al-resistant BW69 line responded two-hours earlier to Al stress than the Al-sensitive JW81 line with the highest expression level of GsMATE up to 8.6-fold and 11-fold detected after treatment for 6 h and 8 h in the two lines, respectively (Fig. 3b). To examine its subcellular localization, the GsMATE sequence was fused to the GFP reporter gene at the 5′-terminus under the control of the CaMV 35S promoter. The recombinant constructs encoding the GsMATE-GFP fusion protein and GFP alone (pYL322-d1-eGFP vector) were then transformed into Arabidopsis protoplasts by heat-shock. As shown in Fig. 4a, the GsMATE-GFP fusion protein accumulated mainly in the membrane with strong signals of green fluorescence located in the cell membrane. 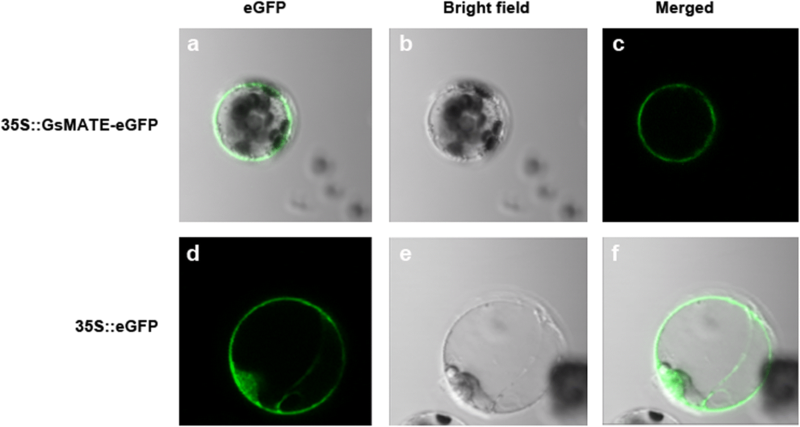 In contrast, GFP alone was observed as green fluorescence emitted throughout the whole cell (Fig. 4d). These observations were consistent with the predicted function of GsMATE as a membrane protein (Additional file 3: Figure S1b). More than 19 GsMATE transgenic plants of the T1 generation were further identified by PCR amplification of the hygromycin gene encoded by the pCAMBIA1301 vector (data not shown). The results indicated that GsMATE has been integrated into the Arabidopsis thaliana genome (Additional file 4: Figure S2a). Transgenic lines of the T2 generation were identified by qRT-PCR analysis of the GsMATE overexpression in Arabidopsis at the RNA level. Two transgenic GsMATE lines were selected to investigate the phenotype and mechanism of resistance to acidic aluminum (Additional file 4: Figure S2b). To investigate the responses of GsMATE transgenic lines to Al stress, Arabidopsis seedlings were exposed to AlCl3 at 0, 50, 100, and 150 μM for 7 days. The results showed that the relative root length (taproots and lateral roots) of GsMATE transgenic lines was significantly greater (>80%) than those of the wild-type under Al stress at 50 and 100 μM AlCl3 (Fig. 5a). 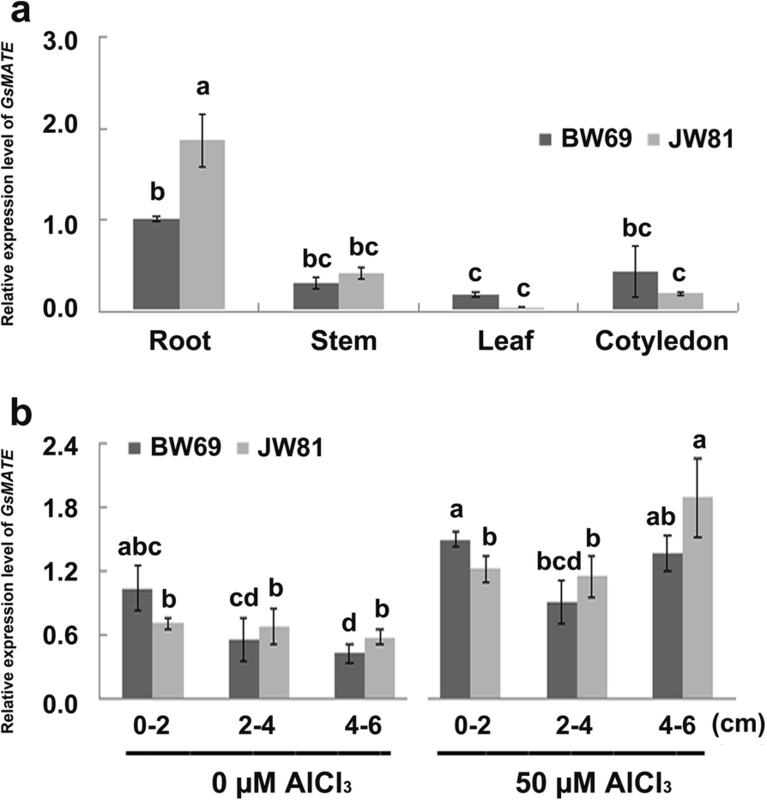 However, under 150 μM AlCl3, root elongation was completely inhibited in both the GsMATE transgenic lines and wild-type Arabidopsis performing similar phenotypes and relative root lengths (Fig. 5a). Furthermore, the Arabidopsis seedlings exhibited similar Al-resistance phenotypes under Al stress for 2 days (Additional file 5: Figure S3). These results indicated that GsMATE overexpression may improve the tolerance to aluminum stress in Arabidopsis. To further confirm the involvement of GsMATE in resistance to aluminum toxicity, T3 generation Arabidopsis seedlings were harvested after developing for 12 days in 1/2 MS media, followed by treatment with AlCl3 (0, 50, 100, and 150 μM) for 30 min. Hematoxylin staining of the roots of GsMATE transgenic lines increased in intensity with the increased concentration of aluminum. Furthermore, at the same concentration of AlCl3, the intensity of hematoxylin staining was much greater in the roots of wild-type Arabidopsis seedlings than those of the GsMATE transgenic plants (Additional file 5: Figure S3). These observations indicated that GsMATE may enhance the resistance of transgenic plants to Al toxicity by inhibiting the accumulation of aluminum in the roots. The present study aimed to investigate the function of GsMATE gene response to acidic aluminum. Previous reports showed that MATE proteins represented a large family in bacteria, fungi, plants and mammals which can transport numerous substrates . The plant MATE proteins characterized to transport citrate are involved in several physiological processes including Al-tolerance [1, 6, 15–19, 21–24, 26], iron translocation [23, 30, 32], heavy metals , toxins , vacuolar transport of nicotine [34–37], chloride channels ; ABA efflux ; transport of secondary metabolites such as alkaloids, flavonoids, and anthocyanins [36, 40–42]; and phosphorus efficiency. In this study, a GsMATE gene encoding an Al-activated citrate MATE transporter was cloned from the BW69 line of wild soybean and used to characterize the functional properties as well as its potential role in plants. Our results have shown that GsMATE plays a role in citrate secretion. First, GsMATE is expressed mainly in roots with an expression pattern that is specifically up-regulated by Al with higher expression level in the root tips (Figs. 1 and 2). Second, similar to other MATE transporters involved in Al-induced citrate secretion, the GsMATE protein is also localized predominantly at the plasma membrane in protoplasts (Fig. 4). The soybean MATE family is large, consisting of at least 117 members located on chromosomes 1 to 20 with uneven distribution. 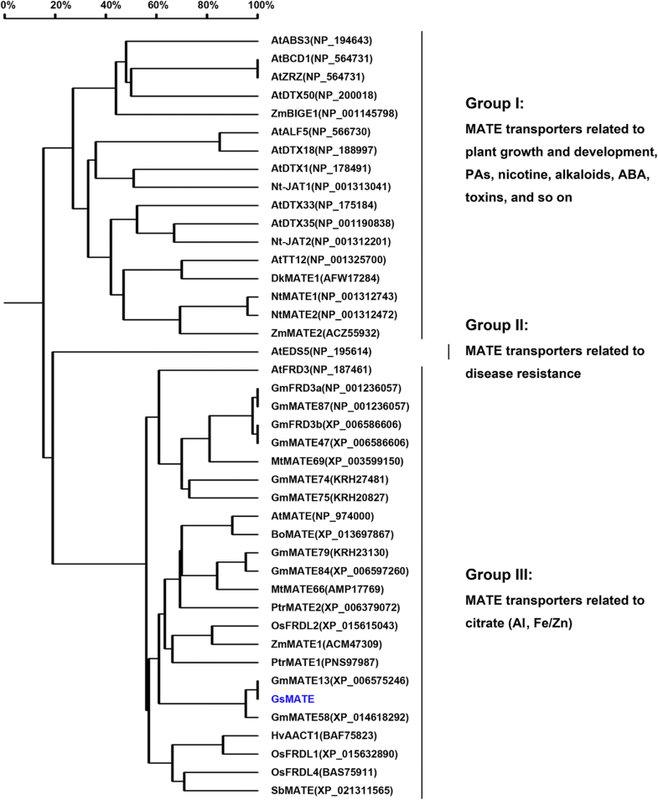 Most MATE genes exhibit tissue-specific expression patterns ; however, genome-wide association analysis of MATE transporters showed that soybean MATE family could be classified into four subfamilies comprising a total of ten smaller subgroups with diverse potential functions, including extrusion of compounds, regulation of disease resistance, transport and accumulation of flavonoids or alkaloids, and responses to abiotic stresses . Based on previously reported MATE proteins, further analysis revealed that eight soybean MATE transporters clustered together were related to Al detoxification and iron translocation . In the present study, the phylogenetic analysis was carried out using the available amino acid sequences of reported MATE proteins and the eight soybean MATE transporters. Homology analysis showed that GsMATE which was clustered with eight Al-induced soybean MATE transporters in Group III covering Al detoxification and iron translocation (Fig. 1). Amino acid sequence alignment showed that GsMATE has only one different amino acid at the end of C-terminal compared to that of GmMATE47 (data not shown). In addition, GmMATE87 and GmFRD3a have the same sequence, while GmMATE47 has the same sequence as GmFRD3b  with the exception of 15 additional amino acids at the end of N-terminal of GmMATE47 (Fig. 1, data not shown). Previous studies showed that the expression of GmFRD3a and GmFRD3b induced by iron deficiency in the iron-efficient reference cultivar Williams 82 played a role in iron translocation in soybean . Differential gene expression analysis indicated that GmMATE47 and GmMATE87 were related to aluminum detoxification and iron translocation. While GmMATE75, which is the candidate gene among the eight identified MATE genes for Al tolerance in soybean, is rapidly up-regulated by Al stress . In our study, heterogenous overexpression of GsMATE enhanced the resistance to Al stress in Arabidopsis (Fig. 5). Therefore, our results provided a foundation for further investigation of the functions of soybean MATE genes including the candidate gene for Al tolerance in soybean. The GsMATE gene encodes a transmembrane protein that is enriched in soybean roots, and is up-regulated in response to acidic aluminum. GsMATE overexpression enhances the resistance to Al toxicity in transgenic Arabidopsis plants. These results indicated that the GsMATE protein may be responsible for external detoxification of Al by mediating root citrate efflux. Qibin Ma and Rong Yi contributed equally to this work. The authors would like to thank Dr. Karen Bysouth (The Peerwith Team) and Dr. Bo Zhang (Assistant Professor, Virginia Tech, USA) for improving the English language of the present manuscript. We are very grateful to Prof. Qinghua Pan and Prof. Yaoguang Liu from South China Agricultural University for kindly providing us with the 35S::ARF19IV-mCherry vector and the pYL322-d1-eGFP vector, respectively. This work was supported by grants from the National Natural Sciences Foundation of China (31771816, 31371642, 30971814), the Major Projects of New Varieties Cultivation of Genetically Modified Organisms (2016ZX08004002–007), the China Agricultural Research System (CARS-04-PS09), the Research Project of Plant Biology for Undergraduate Students of South China Agricultural University (6900–32990369), and the Research Project of the State Key Laboratory for Conservation and Utilization of Subtropical Agro-bioresources (4100-M13024). Sequence data are available from Additional file 2 and the NCBI’s GenBank under the accession number XM_006575183 (https://blast.ncbi.nlm.nih.gov/Blast.cgi#alnHdr_ 955307808). Any other datasets supporting the conclusions of the present article are contained in text and additional files. QM, XL and HN designed the research. RY carried out gene cloning, vector construction, expression pattern analysis, genetic transformation of Arabidopsis, and GsMATE protein localization. LL, ZC completed the analysis of the resistance to Al toxicity phenotype. YC and YM reproduced and prepared all the plants for research experiments. ZL, ZT, YZ, and HH carried out the molecular identification of GsMATE transgenic plants. XY, XZ and QZ performed the gene sequencing, gene bioinformatics analysis and hematoxylin staining. QM, RY, XL and HN prepared the manuscript. All authors read and approved the final manuscript.